When I finally made the decision to start eating healthier, one of the meals that I targeted to change was lunch. For one, I realized that I was spending about $60/week alone just by eating out with co-workers. Also, I found myself tired and sluggish after eating heavy lunch meals, which affected my productivity and mood at work. 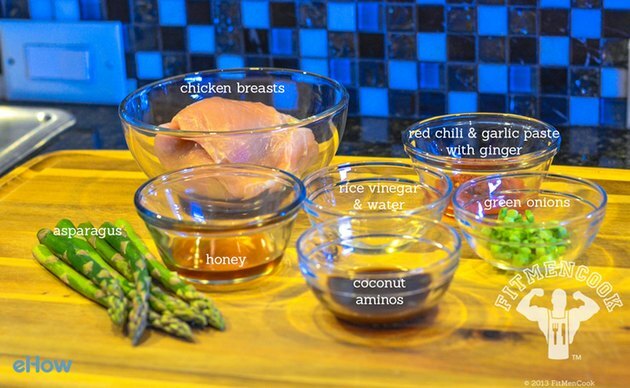 This is one of the easiest recipes I have used for my meal prep to ensure that I get a serving of both protein and veggies. Additionally, I learned that preparing the chicken this way made organizing meals for the week much easier—I could prepare five servings (or five days worth of lunches) in less than 30 minutes. I don’t know about you, but for some reason or another, around lunchtime I often crave Chinese food. 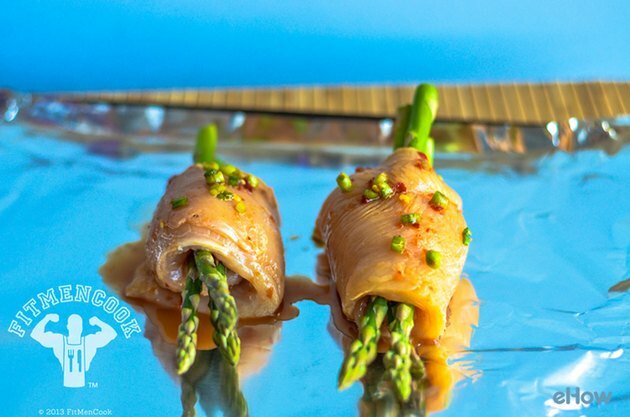 Instead of heading over to the nearest Chinese buffet, try this variation of the FitMenCook chicken wrapped asparagus with a healthier homemade teriyaki sauce. Remember to always customize portions to complement your goals and your diet. 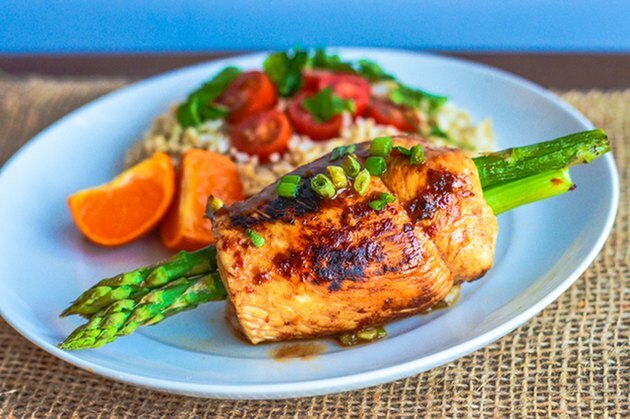 Set oven to 375° F.
Cut and trim fat from chicken breasts so it is about six ounces. If the chicken breast is very thick, pound with your fist or meat mallet to soften and flatten. The meat should be thin enough to roll and close. Set aside in a bowl. 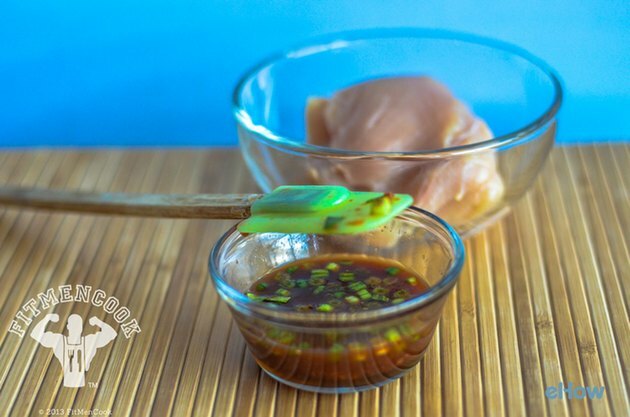 Pour the sauce over the chicken and mix thoroughly, ensuring all sides of the chicken breasts are covered. 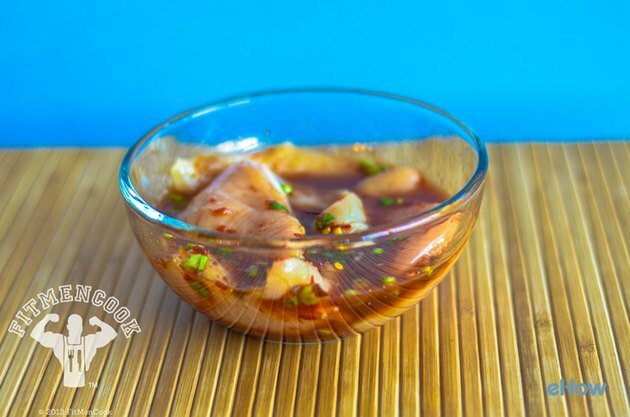 Refrigerate and marinate for at least 30 minutes. I prefer marinating at least four hours, sometimes even preferably overnight. Just be sure to place the chicken in an airtight bag or container with the sauce. Trim the bottom stems from the asparagus spears. 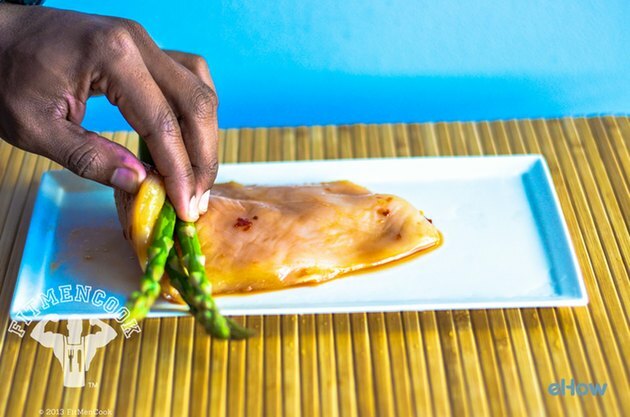 Place three asparagus spears at the thick end of the chicken breast and completely roll the asparagus in chicken. Place the roll on a baking sheet or foil lined pan with the ending flap down so that the chicken roll bakes closed. Drizzle excess sauce over the chicken roll. Place foil over the tips of the asparagus spears to prevent any burning during baking. Bake rolls in the oven for 10-12 minutes. If you have extra time before baking, brown all sides of the chicken roll in a non-stick skillet set to medium heat for 3-4 minutes. This will enhance the flavor of your chicken. Serve with your choice of carbs. I used jasmine brown rice mixed with cherry tomatoes and cilantro, and one clementine.